Our Personalized Walk Breast Cancer Awareness T-shirt is a great way to show your support for Breast Cancer Awareness. Proudly display who you are walking for with this unique Breast Cancer Walk Shirt and show your never ending commitment to find a cure. 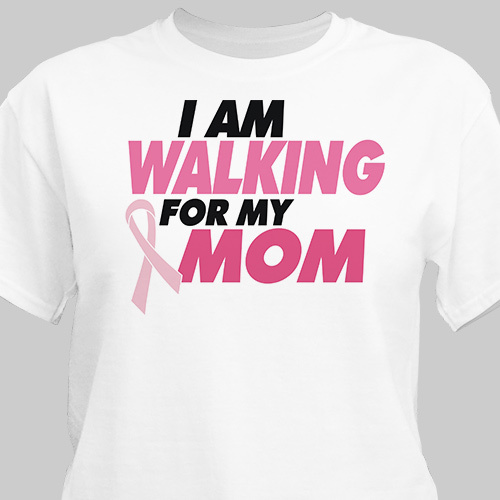 This Walking for Breast Cancer Shirt is available on our premium white 100% cotton T-Shirt, machine washable in adult sizes S-3XL. Also available on Pink. Includes FREE Personalization! Personalized your Walking T-shirt with any title. Check below for quantity discounts. My sister died almost four years ago from cancer. My nieces and sister will be wearing these shirts in the cancer walk here on Maui next summer. Great product for my husband when we walk for breast cancer. Additional Details Breast Cancer awareness Month is October. Get your Walking for Breast Cancer Shirts at GiftsForYouNow.com. There are many Breast Cancer Shirts to choose from & each is personalized so you can show the world exactly who you are walking for. Get your Breast Cancer Awareness Gifts today.